Ary Faraji is an entomologist who, for 18 years, has studied mosquitoes and the diseases that they transmit. Ary Faraji is an entomologist who, for 18 years, has studied mosquitoes and the diseases that they transmit. As assistant manager and entomologist with the Salt Lake City Mosquito Abatement District, he has been closely following news of the mosquito-borne Zika virus. Read more about this outbreak at CityWeekly.net. Why is the Zika virus showing up right now? Zika virus is not a new disease. It's an illness that scientists refer to as an emerging or re-emerging vector-borne zoonotic disease. A vector is an agent, like a mosquito, that can carry and transmit an infectious pathogen to another living organism, and zoonotic refers to an infectious disease in an animal that can be transmitted to humans. Historically, Zika virus has been largely confined to equatorial Africa in the tropics where it circulated predominately between forest dwelling mosquitoes and wild primates. Why is the Zika virus being called a pandemic? Are the mosquitoes migrating? The virus has spread to Asia, the Pacific Islands and now Central and South America. The virus is not continent-hopping via the spread of mosquitoes, but rather because of the frequency and rapidity of air travel by humans. It is not unlikely for an individual to become bitten by an infected mosquito in an area where the virus is circulating, and then hop on a plane and land in a new area within a short span of time. Will Utah mosquitoes eventually become carriers of it? The short answer is no. 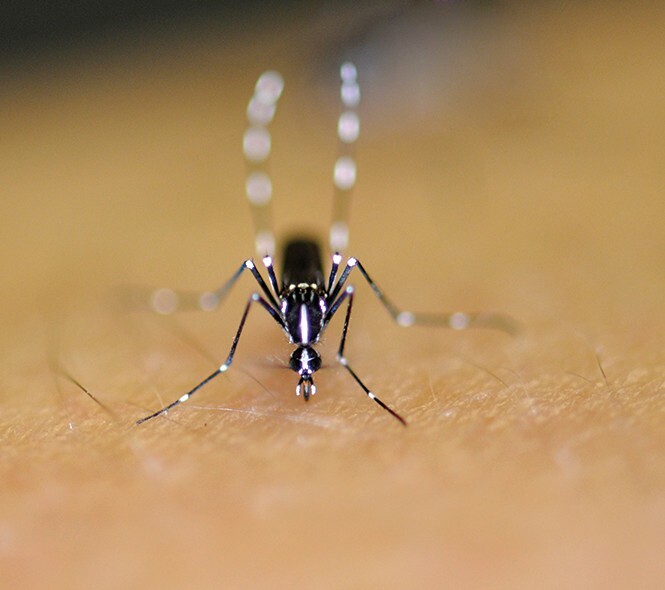 Currently the climate in Utah (severe cold winters) is too harsh for the establishment of Aedes aegypti or Aedes albopictus (pictured), which are primarily tropical or sub-tropical species. However, populations of Aedes albopictus have successfully invaded the eastern United States, as far north as Massachusetts, and global climate change may eventually allow the establishment of this species even in Utah. Our local mosquito species (we have 51 of them in Utah and 16 in Salt Lake City) have not been shown to be vector competent for Zika virus. What's the best advice for not contracting the disease? Stay north and west? Avoid areas where virus activity is currently high. If not, protect yourself from mosquito bites. Wear long-sleeve shirts and pants, treat or purchase clothing with a built-in repellent such as permethrin, treat exposed areas of your skin with an EPA-approved mosquito repellent and stay indoors during active mosquito periods. And above all, stay calm and carry on. What is it about mosquitoes that intrigues you? Mosquitoes are the true vixens of the insect world. Some species are absolutely beautiful and mesmerizing, and yet can carry debilitating and deadly diseases with global impact. They are by far the deadliest animal on our planet, having determined the outcomes of war for thousands of years. In fact, more soldiers have succumbed to the diseases that they carry than actual swords or bullets.